Bir KULLANILAN arıyorsunuz SVT6000-C/MC ? SVT series is best-suited for round, large-diameter and irregular shaped workpieces. The SVT series has been developed by SNK based on its long-accumlated experience and expertise in manufacturing large and super-large machine tools for the coming age of new energy. 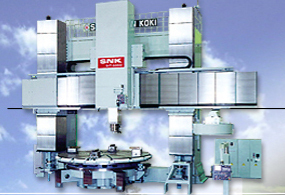 shin nippon koki co., ltd., also known as snk, aggressively extends its sphere of activities into newer fields, looking to the next century, and pushing itself to the limits of technology, always with the needs of the user in mind. 124 ModelHakkında daha fazla vew SNK - Shin Nippon Koki., Ltd.
Yeni satın almak isteyen SNK SVT6000-C/MC ?